THE HAGUE - Gerel Palm has been on the National Search List for a year now. 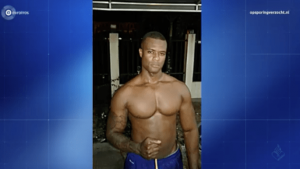 After he fled from a prison in Paramaribo in April 2017, he went missing. The police hope to distribute new photos on tips about his possible whereabouts. The judiciary also praises a reward of 15,000 euros for the tip that could lead to his arrest. Presumably, Gerel Palm still has contact with people in the Netherlands. On 15 June, Gerel Palm's driving license was found on the street near the Nijpelsplantsoen in Nieuwegein. What makes the police ask the question: would Palm be in the Netherlands or have contacts with people in the Netherlands? The police have made two photographs available. On one of them is Palm with a tattoo on his right arm. On the other he is sitting in a chair with a blue polo. The police want to know if witnesses can say where the photos were taken. Gerel Palm has been a suspect for some time in the investigation into the liquidation of spy shop owner Ronald Bakker. He is now being sought for his involvement in a double liquidation attempt on 10 December 2016 in Noordeloos, the Netherlands. A passerby saw something in the bank that night, it turned out to be a badly injured man. In his neighborhood was another two men, also badly injured. It concerns two Rotterdammers aged 28 and 35 years. They turned out to have been shot. The investigation into the criminal from Curaçao runs from the National Public Prosecutor's Office in Rotterdam. The name of Gerel Palm is frequently mentioned in collaboration with big names from the mocromaffia. He would stay with other fugitives such as Ridouan Taghi and, according to rumors in the underworld, are involved in liquidations. According to tips received by the police, he was in South America and possibly also in the Netherlands and Germany for a short time since his escape. In a message on the police site, questions are asked about how a driving license from Gerel Palm ended up on the street in Nieuwegein and whether someone has recently seen him in the Netherlands. In the hope of being able to trace Palm, justice pays a reward of 15,000 euros for the tip the can lead to the arrest.